with a live performance by Harmanpreet. Learn some cool moves at the salsa and merengue workout week 2 session by Beats & Fusion or show off your bhangra steps at the Punjabi folk music and beatboxing session by Meet Singh & Group. 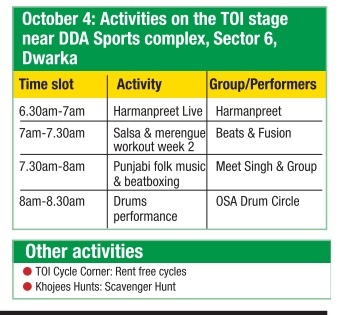 You can also grab your djembe or grab a makeshift drum and join the drums performance by OSA Drum Circle or rent a cycle for free from the TOI Cycle Corner. There's also going to be a scavenger hunt by Khojees Hunts.